October is the perfect time to visit Georgia’s most beautiful city. It’s a good deal cooler than in the summer and Savannah has a host of different festivals on for all age groups. Expect busy crowds with multiple events on each weekend that are guaranteed to get your taste buds moving and your cultural knowledge up to date. 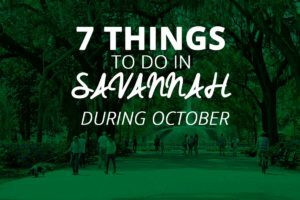 The month ends with Halloween which is another reason to visit Savannah, reputedly one of the most haunted cities in the country. Make your reservations ahead of time because this month plans to be a busy one. Get your German hat and grab your beer mug for another riotous three days of the annual October festival. The tapping of the keg opening ceremony begins at 4 pm which is then followed by endless supplies of German craft beer, bratwurst, and live music. There’ll also be a comedy hour on each day and a kid’s zone for families to let their little ones enjoy. With pub crawls, museum tours and award-winning singers, this year’s Pride festival promises to be a big one. Bars and pubs all around Ellis Square will be doing promotional drinks and there’s a museum tour for every interest. After being inspired by the art exhibits be sure to sign up for one of the workshops and seminars. When the downtown takeover begins, Grammy award-winning singer Estelle will be leading the entertainment. The quarterly SCAD FILM festival spotlights some of the hottest entertainment this year with a host of honorary guests such as Salma Hayek Pinault, Zoey Deutch, Richard Gere and Sir Patrick Stewart, to name just a few. Blockbuster premiers, fascinating documentaries, and stunning visuals will be found in abundance. Get your dose of adrenaline at the Savanah Speed Classic hosted on Savannas own Hutchinson island. With its cobblestoned streets and historic past, the island comes alive for three days at the birthplace of Grand Pix racing. For engine and speed lovers this is a great day out family, couples, and friends. This year’s Shalom Y’All Jewish Food Festival will be held on the last Sunday of October from 11 am to 3 pm. Come for the food stay for the culture. This annual event draws about 10,000 people and features delectable Jewish cuisine dishes and entertainment for all ages. Both kids and adults are in for a scare this month. The Savannah Ghosts and Folklore tour brings you on a guided tour of Savannah’s most famous ghostly sites and legends. This southern Gothic town has heaps of history hidden in its walls and more than a few tragic events that have birthed legends. The Ghost Trolley Tour takes you around Savannah’s historic district and trills you with stories of hanged slaves, suicidal wives, and murdered husbands. Get into the spirit of Halloween with one of these terrifying tours. Adults will love the fun, fear, and romp of the savannah Haunted Pub Crawl. Get your costumes on and join the guide (also in period costume) for a humorous and intriguing 2-hour candlelit walking tour. You’ll get to sample both types of ‘spirits’ in Savannah’s hallowed pubs. Almost every pub has its own ghost story and what better way to see Savannah then with two of its most time-honored traditions, ghost stories, and alcohol.